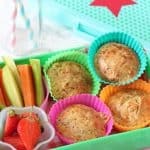 Delicious and mild Broccoli & Goats Cheese Muffins, perfect for kids’ lunchboxes or to take out and about as a snack! Chop the cooked broccoli into small pieces. In a large bowl mix the flour and baking powder together. Add in the milk and eggs and stir well. Add the cheese, herbs and salt and pepper and mix until just combined. Line a muffin tray with 10 silicone cases and divide the mixture between them. Bake in the oven for 25 minutes until cooked through and the tops are golden brown. The muffins will keep in the fridge for up to 3 days or can be frozen too.